Every year in mid-November I help my friend Bradley close up his cabin near the Rogue River in southwestern Oregon. 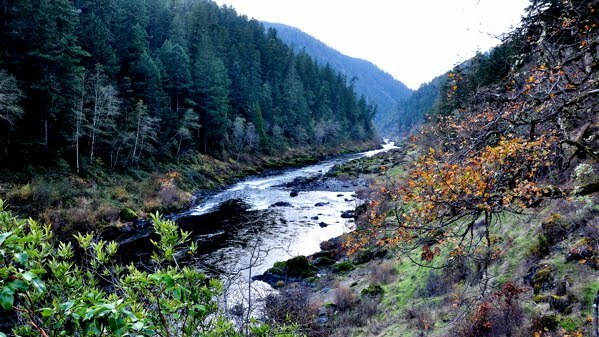 The Rogue is one of only a handful of coastal rivers that can boast a significant roadless section, in this case a 30-plus mile stretch of river that flows through the Congressionally designated Wild & Scenic lower canyon and the adjacent Rogue River Wilderness. It's rugged country filled with bears, cougars, hermits, and goldpanners. 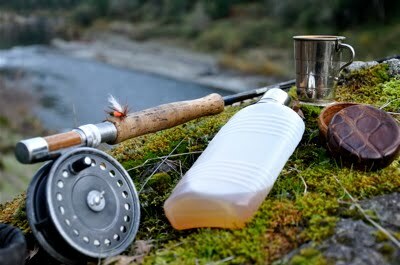 After the chores are attended to, we hike the trails, fish for steelhead, hunt mushrooms, and whump up big meals on the wood stove. This annual trip is pretty much the capper on my year of wild food foraging. I don't get many opportunities to pick queen boletes (Boletus regineus). They're most often found in mixed woodlands of the coastal mountains to the south of me, in Northern California and Southern Oregon, particularly the lower elevations where tanoak thrives and puts the hurt on anyone hoping to bushwhack around those river valleys below snowline. I've never found them in Washington, probably because I rarely encounter tanoak here. Besides habitat, the best way to distinguish the king and queen in the field is cap color (see photo at right). 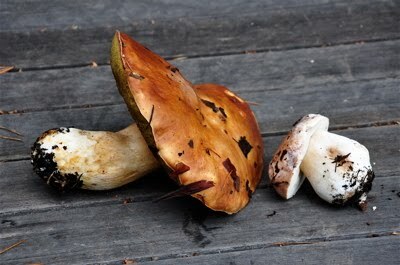 Queen boletes will have darker caps at maturation, sometimes a rich mahogany brown, and the younger specimens, while often lacking dark caps at this stage, will frequently have a whitish bloom across the cap that can be rubbed off with your finger. They're generally smaller than kings too. One of the cool things about the queen is that it fruits later than the king, at least where I pick it, and often in troops, so you can still get fresh porcini even after the kings have gone to dirt. Our queen is not the same species as the one found in the Old World. 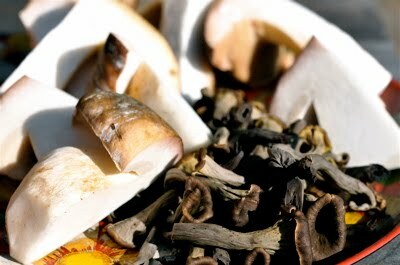 That's Boletus aereus, which by all accounts rivals Boletus edulis, the king, for its porcini flavor and aroma. Boletus regineus is similar with its dark brown cap but tastes milder. On the plus side, the flesh is white and firm like the king yet often lacks the insect infestations of its more heralded partner in royalty. 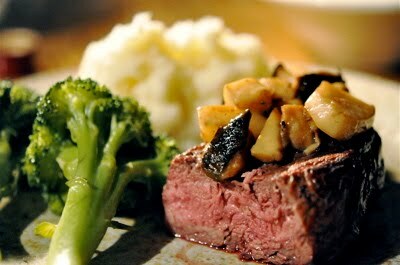 We ate the queen with steak one night and sauteed it up with black trumpets another night to serve over crackers. 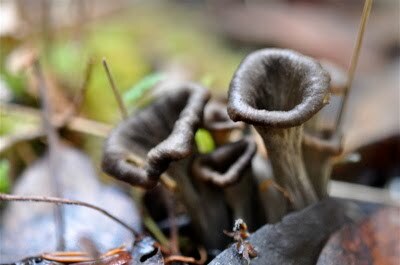 Speaking of black trumpets (Craterellus cornucopioides), this is another species I only see in the Rogue. We never find large quantities, just enough to savor that wonderful woodsy, almost smoky flavor. Northern California is the strike zone for the trumpet. I've heard professional foragers reminisce about enormous patches in the hills just inland from the Pacific. Supposedly there are a few patches of well-guarded trumpets in Washington but I've never found them. Instead I look to the Rogue each year to satisfy my craving. Sometimes we get just a taste that must last us through the year. "They're not big, but they don't know it." The owner of the Silver Sedge Fly Shop told me that years ago when I stopped in to buy some fly-tying materials. He was talking about immature steelhead that probe the lower Rogue River before dropping back into the salt to finish their growth. Known as "half-pounders" to locals, these torpedo-shaped flashes of silver average 12 to 15 inches yet attack flies with the hellbent abandon of much larger fish and they're a hoot on light fly gear. As in previous years, I took a single hatchery half-pounder home to share with the family so they could get a taste of the Rogue. The other fish, most of them wild, were released back into the drink. You learn something new every day... today, it was about boletes. Thanks for always being a source for inspiration! Thanks for the post. My husband & I both enjoy your blog. He's the main forager in our household, but that season is long past. Do you have plans to visit Alaska? wanted for a long time to experience both the river and the brewery. sounds like that is a fantastic trip to look forward to every year. nice post. I, like Lo, just learned a great deal about boletii (? ), and now have greater sympathy with the prices of fresh porcini State-side. That said, if these West Coast varietals are rivals in taste why are they not sold more widely across the country? I would certainly buy as many as i could afford! Beautiful country! Northern California is definitely the place for craterellus, two seasons ago i found nearly 80 pounds overthe course of the season. This should be a good year as well if the rain keeps up. Lo - Amen to that. Learning ain't just for kids! r. hurd - Love Rogue beers, some of my favorites. I'm biased toward the river; it's one of the greats. Jonny - Good question, one that I'm not sure how to answer. Certainly on the West Coast there's a semi-vigorous trade in porcini (boletes). You might not find them as much on the East Coast because they don't travel well (can get wormy, among other things). 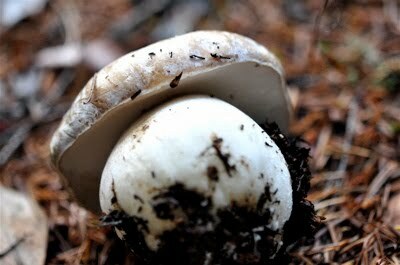 Of course, you have your own populations of porcini back East, such as Boletus edulis, though maybe not in the numbers that flush in the coniferous forests of the West. As you pursue this question, let me know your findings. Perry - I'm envious. The black trumpet is superb, and though I never find it in quantities for putting up, I hear it's quite good dried. Dried craterellus are nearly as good as fresh, and quite a bit more flavorful. B.edulis on the east coast are pretty uncommon (mid-atlantic) but might be more abundant closer to new england, still nowhere near like they are west of the rockies. Mushrooms here also tend to be wormier than their west coast counterparts (even craterellus) which is a major issue for commercial guys. The mushroom buyers here (even at the farmers markets) get a lot of their fungus from west coast suppliers. The main exceptions to that are morels, maitake and chicken of the woods. 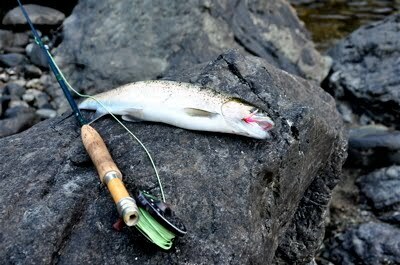 Just got into some steelhead on the Trinity River in California. Caught three, kept two hatchery fish (one 6, one 7 pounds) and had a blast! Will be eating them over the course of this week.